Apache™ Hadoop® is an open source software project that enables the distributed processing of large data sets across clusters of commodity servers. It is designed to scale up from a single server to thousands of machines, with a very high degree of fault tolerance. Rather than relying on high-end hardware, the resiliency of these clusters comes from the software’s ability to detect and handle failures at the application layer. Hadoop 1 popularized MapReduce programming for batch jobs and demonstrated the potential value of large scale, distributed processing. MapReduce, as implemented in Hadoop 1, can be I/O intensive, not suitable for interactive analysis, and constrained in support for graph, machine learning and on other memory intensive algorithms. Hadoop developers rewrote major components of the file system to produce Hadoop 2. To get started with the new version, it helps to understand the major differences between Hadoop 1 and 2. 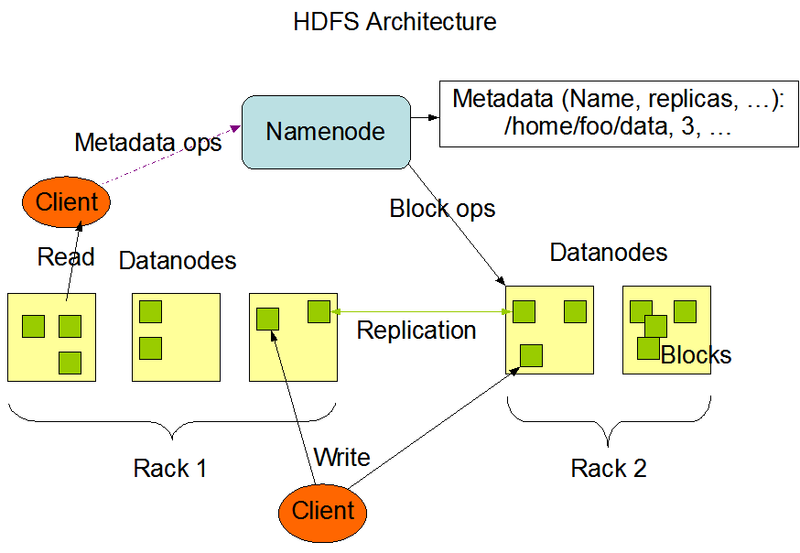 HDFS is the Hadoop file system and comprises two major components: namespaces and blocks storage service. The namespace service manages operations on files and directories, such as creating and modifying files and directories. The block storage service implements data node cluster management, block operations and replication. As part of Hadoop 2.0, YARN(Yet Another Resource Neogitator) takes the resource management capabilities that were in MapReduce and packages them so they can be used by new engines. This also streamlines MapReduce to do what it does best, process data. With YARN, you can now run multiple applications in Hadoop, all sharing a common resource management. Many organizations are already building applications on YARN in order to bring them IN to Hadoop. When enterprise data is made available in HDFS, it is important to have multiple ways to process that data. With Hadoop 2.0 and YARN organizations can use Hadoop for streaming, interactive and a world of other Hadoop based applications. Apache Hadoop YARN joins Hadoop Common (core libraries), Hadoop HDFS (storage) and Hadoop MapReduce (the MapReduce implementation) as the sub-projects of the Apache Hadoop which, itself, is a Top Level Project in the Apache Software Foundation. Until this milestone, YARN was a part of the Hadoop MapReduce project and now is poised to stand up on it’s own as a sub-project of Hadoop. The processing power in data centers continues to grow quickly. Because YARN ResourceManager focuses exclusively on scheduling, it can manage those larger clusters much more easily. Existing MapReduce applications and users can run on top of YARN without disruption to their existing processes. The ResourceManager is a pure scheduler that optimizes cluster utilization according to criteria such as capacity guarantees, fairness, and SLAs. Also, unlike before, there are no named map and reduce slots, which helps to better utilize cluster resources. Additional programming models such as graph processing and iterative modeling are now possible for data processing. These added models allow enterprises to realize near real-time processing and increased ROI on their Hadoop investments. With MapReduce becoming a user-land library, it can evolve independently of the underlying resource manager layer and in a much more agile manner. The ResourceManager and the NodeManager form the new, and generic, system for managing applications in a distributed manner. The ResourceManager is the ultimate authority that arbitrates resources among all the applications in the system. The per-application ApplicationMaster is a framework-specific entity and is tasked with negotiating resources from the ResourceManager and working with the NodeManager(s) to execute and monitor the component tasks. The ResourceManager has a scheduler, which is responsible for allocating resources to the various running applications, according to constraints such as queue capacities, user-limits etc. The scheduler performs its scheduling function based on the resource requirements of the applications. The NodeManager is the per-machine slave, which is responsible for launching the applications’ containers, monitoring their resource usage (cpu, memory, disk, network) and reporting the same to the ResourceManager. Each ApplicationMaster has the responsibility of negotiating appropriate resource containers from the scheduler, tracking their status, and monitoring their progress. From the system perspective, the ApplicationMaster runs as a normal container.